Pioneers in the industry, we offer horizontal flow wrap machine, chocolate bar wrapping machine, candy wrapping machine and soap wrapping machine from India. We deal in Horizontal Flow Wrap Machine. 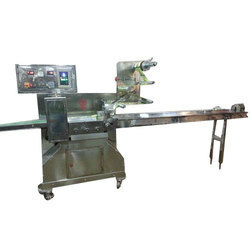 Our range of Horizontal Flow Wrap Machine is used in the packing of solid products like candies, chocolates, ice bar, bread, biscuits, syringe, cakes, instant noodles, soaps, bottles, stationery, disposable syringes, machine parts and many more. 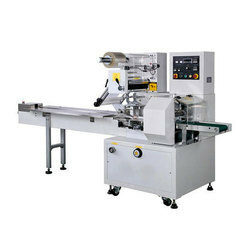 The horizontal wrapping machine is equipped with neat pipe type end sealer for obtaining strong and neat seam. Transfer brush, discharge brush, date printer and gusseting are attached to the machine giving the option of customized packaging. We are indulged in offering premium quality Chocolate Bar Wrapping Machine which is known for its outstanding functionality. Best of the materials are used to integrate the machine which is reliable and durable. We offer the machine at affordable rates. 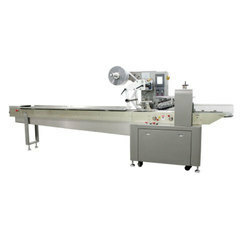 The horizontal wrapping machine is equipped with neat pipe type end sealer for obtaining strong and neat seam. Transfer brush, discharge brush, date printer are attached to the machine giving the option of customized packaging. 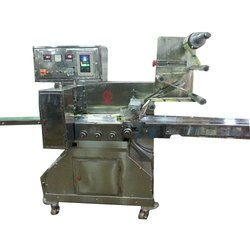 We are offering Soap Wrapping Machine to our clients.